If there’s one company you can count on for bringing quality games to Microsoft’s Xbox 360 it’d be Epic Games. Back in 2008 the makers of the infamous Gears of War series scooped up a little gaming company in Utah called Chair Entertainment and with that came the downloadable game Shadow Complex. Instead of a retail release, Epic and Chair released the game as exclusive downloadable content through the Xbox Live Arcade. Taking notes from classic 2D action adventure titles like Metroid and Castlevania, Shadow Complex mixes the best of the genre and takes it a whole new level. Set in the world of Empire, a novel by Orson Scott Card, Shadow Complex unwillingly pits an every day man, Jason Flemming against a radical left-wing militia that’s plotting to overthrow the US government by attacking San Francisco and send the country into a second civil war. You’re immediately thrust into the middle of the conspiracy as a government operative as you try to prevent the assassination of the Vice President. After a brief shootout you’re quickly transported to the Pacific Northwest as you, this time playing as Flemming, and your new girlfriend take a hike in the woods. Unfortunately things aren’t as peaceful as they seem and you quickly find yourself alone and searching for your girlfriend as you try to avoid the group of extremists that are hell bent on destroying San Francisco. Shadow Complex is a 2D game in a 3D world. The game play is entirely 2D, but it’s rendered entirely in 3D, giving it a lot of depth. Enemies can come running down a hall in the background towards you. It’s a nice setup that gives Shadow Complex a modern feel, but it does bring with it some minor issues. The biggest being the aiming. It takes a while to get used to the aiming and since enemies can come from any which way it takes a bit longer than you’d expect. Luckily the games xp feature, allowing you to level up throughout the game, makes aiming a bit easier but by the time you’re in the thick of it you shouldn’t have a problem blasting the bad guys away. Control wise, it’s pretty straight forward. Flemming’s movements are restricted to up, down, left and right. Melee with the B button, jump with the A button, shoot your gun with the right trigger, activate your flash light with the left bumper, switch to your other weapon with the right bumper and that’s pretty much it. You really can’t get any easier than that. Unfortunately there’s no multi-player feature for Shadow Complex, but considering that the game is now only 1200 Microsoft Points, or $15, and you can easily get 8-12 hours of gameplay out of the single player you really can’t complain. Once you’re done with the campaign, there’s still the Proving Grounds, a series of challenge rooms where you have to overcome various obstacles. These can be easy or extremely challenging, forcing you to work through them a few times. Given you can play the campaign or the Proving Grounds, you’ll have hours to entertain yourself. Shadow Complex is a pulp thriller, throwing a rather ordinary Joe into extraordinary circumstances under which he implausibly turns into a one-man army. Flemming isn’t entirely your average Joe though, growing up as an Army brat and having served himself he’s no stranger when it comes to combat and it shows as he progresses throughout the game. Starting off with just a flash light, you’re tasked with rescuing the girl by all means. In classic Super Metroid fashion, the game blocks access to different areas based on which tools you currently have in your possession. You’ll come across some climbing gear and a pistol, which allows you to gain access to higher ledges and certain vents. Exploring the vast underground complex, and battling the various enemies, allows you to gain more experience points and gain new tools that help you rescue the girl and save the country. 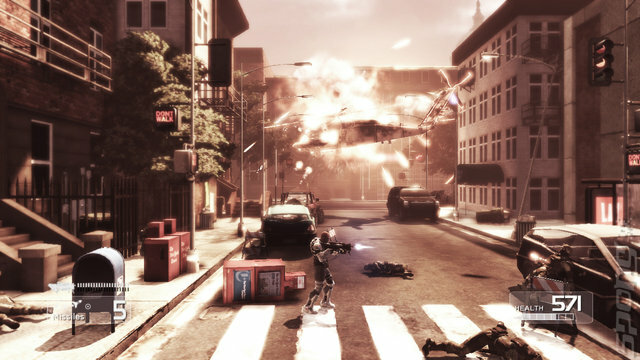 Speaking of the tools at your disposal, Shadow Complex offers a variety of weapons and tools that make the game a unique experience. While you start off with just a flash light you’ll be able to upgrade to various guns and weapons. A foam gun allows you to expand obstacles so they break and allow you access, or encase enemies in foam so they can’t move. The missile attachment for your gun allows you to blast through thick doors and obstacles, while the grenades also provide some big bangs. You’ll also be able to enhance your armor with items like the booster pack, which enables the always popular double jump. The friction dampener allows you to gain supersonic speed when running, allowing you to run up walls or across water. You’ll find that you’ll need to backtrack quite a bit, since you find these upgrades scattered throughout the game, you may find a certain weapon in the later part of the game. Thankfully you don’t need all the weapons or upgrades to beat the game, so backtracking is optional for the player. The graphics and presentation of Shadow Complex are truly outstanding. It’s an absolutely beautiful game, with some remarkable backgrounds and environments. You’d be forgiven in mistaking this for a full-fledged retail game. The lighting and water effects are top notch and the explosions are quite a sight. It’s the most visually stunning game ever released through the Xbox Live Arcade, and has set the standard for future games. Chair have really utilized the Unreal Engine and one can only imagine what they’ll be able to do in the future. Heck, they’ve even given us a gripping story with some captivating characters. The voice-acting is also top notch and it’s great hearing Nolan North voicing Flemming, although he reminded me a lot of another character he voices, a one Nathan Drake. Shadow Complex even offers a great soundtrack, setting the mood in various levels as well as ratcheting up the drama and suspense. You really get the entire package here and it shows just how much effort Chair put into the game. Shadow Complex is without a doubt one of the best game ever released on Xbox Live Arcade, it was also one of the top 10 games released in 2009. The game offers a lot of action, keeping players engaged for a long time. Best of all, it’s got a lot of re-playability as well, making it well worth the price of admission. And at $15 there’s really no reason not to buy this game.